As school starts back up, we have to get into our “school year habits” and routines, but before we blindly go back to our school habits, we should figure out the science behind everything we do when we go back to school! During the summer, kids don’t always have to wake up at a certain time. This leads to waking up later in the mornings, and sometimes it even results in waking up in the afternoon. What most people don’t understand, though, is that there is so much science involved in the simple process of waking up! There are at least 11 neurotransmitters that play a role in going to sleep and waking up. Of those neurotransmitters, the Orexin neurotransmitter, produced in the hypothalamus, is known to be linked to wakefulness. When you create a new routine or a schedule, there are health processes involved in that. Your brain identifies the routine and gets you in the habit of following the routine every day. Sooner or later, you will complete the tasks on your schedule without realizing that you’re following your routine. Your brain just gets used to the tasks and makes you complete them. When you get in the car/bus/train, get on the bike, or even walk and head to work or school, there is SO much science involved in that! Cars, buses, trains, and bikes are all works of engineers and scientists that designed and planned every aspect of those ways of transportation. When you walk, that is a completely scientific process! There are muscles and bones and limbs and neurotransmitters all involved! The first days of school can be draining, and a lot of it has to do with mental processes. Before you go to school, you feel a mix of emotions ranging from happiness to nervousness to angriness (because your summer was too short). After the first day ends, however, you feel relieved and happy that the day is over. All of these emotions are controlled by your brain, and they simple scientific processes that dictate how you feel. Going back to school is a terrifying and exhilarating experience! Before you get scared or nervous, think about how those emotions are just scientific processes that your brain controls. If you think about it that way, you can control your brain to make you feel excited! 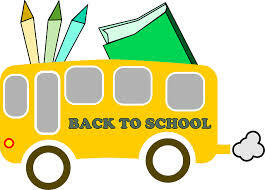 Hopefully everyone’s first days of school went well, and we wish for everyone to have the best school year yet!